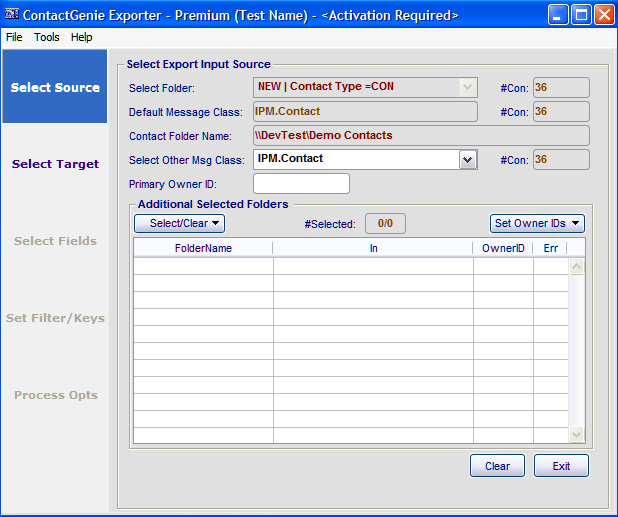 Advanced contact exporter for MS Outlook/Exch '2000-'2007 including including Exch GAL, GDG. Output text format control for date, number, and currency fields. Strip alpha fax prefixes on export without affecting Outlook data. Supports custom fields, multi-folders, multi-lingual field names, standardized CompanyName, FileAs, EmailDisplayAs output values with template and command-line operation. Update option for MS Excel files. ...... Export "duplicates only", "first in set", or "unique only" contact records. Ability to create custom output field names output sequence on export (new file creation only). Ability to append to or create update MS Excel worksheets. * Export all contact types - Contact folders (PST, Exchange Mailbox, Public Folders), GAL, Global Dist Groups and Personal Distribution Groups. * Single or multiple folders - Select multiple contact flders for export in a single operation. * Control output field formats Specify output format for dates, numbers, currency fields. Qweas is providing links to ContactGenie Exporter Adv Ed 1.3.33 as a courtesy, and makes no representations regarding ContactGenie Exporter Adv Ed or any other applications or any information related thereto. Any questions, complaints or claims regarding this application ContactGenie Exporter Adv Ed 1.3.33 must be directed to the appropriate software vendor. You may click the publisher link of ContactGenie Exporter Adv Ed on the top of this page to get more details about the vendor.